I often write about my work with the Air National Guard, but don't often touch on my civilian job—the one that I do full-time. I know I've mentioned it before, but I am a "traditional" guardsman—meaning that I work out on the base just one weekend a month and two training weeks a year (unless I have other training/deployments/etc). The rest of my 40+-hour work-week is spent at the hospital, where I am a Wellness Coordinator. I've worked for the hospital for five years and have had the privilege of working within three different departments... it's been a great growing, learning experience. I love my job with the hospital because I currently work in the department of Occupational Health and Well-being. Our focus is developing and implementing health-oriented programs to our employee population and the surrounding community. We have a few folks who have the same title as me, but we all have different areas of focus. I specialize in healthy pregnancy, weight loss and maintenance, and web and social media marketing. The work we do is very fulfilling, and it's so encouraging to see the healthy changes people make in their lives as a direct result of the programs and opportunities we offer. 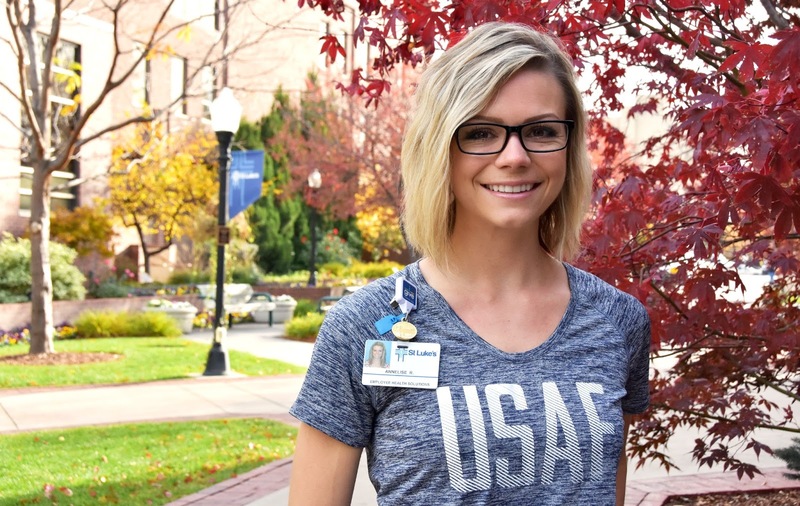 "Annelise Rowe, a Wellness Coordinator at St. Luke's, saw the impact joining the Air National Guard had on her husband. So in November 2013, she enlisted as well. Annelise is an Airman First Class with the 124th Fighter Wing at Gowen Field and will soon receive her commission as a Second Lieutenant. 'It's very humbling to think about those who have dedicated their lives to service,' she said about Veterans Day. 'It's a huge honor to be part of that.'" Honestly, I feel like I get to experience the best of both worlds. Full-time, I have the opportunity to engage with the most amazing employees and Treasure Valley residents on a daily basis. We have a lot of fun doing our job and "sharing the health" with others. And then on the weekends when I get to spend time out at the Air Guard, that's incredible, too. I get to train as a soldier with the hardest working troops out there. I also love the opportunity for growth. 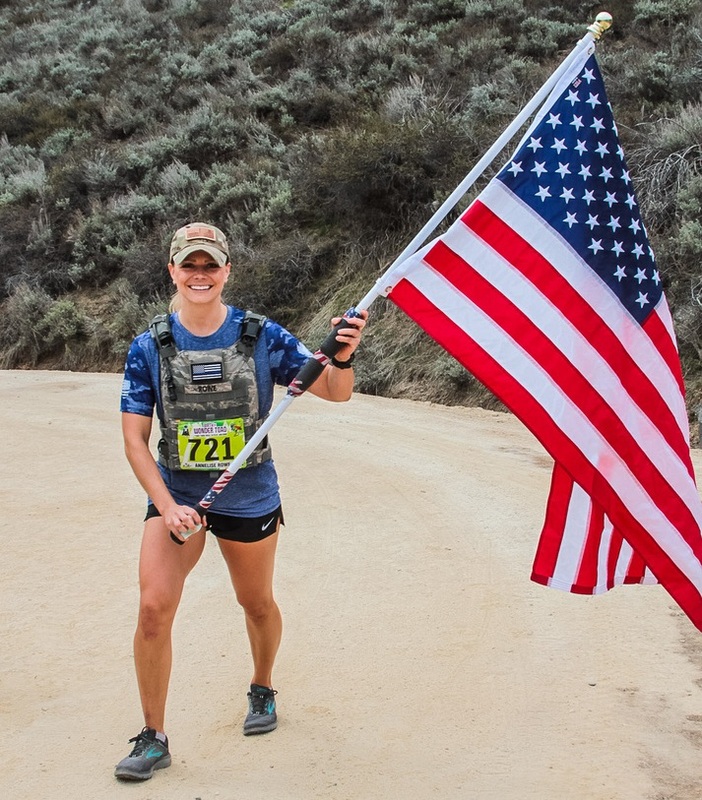 As a civilian, I am allowed the creativity to create and deploy new healthy-minded projects and have the ability to pilot almost anything that I can come up with. A BABY (Best After Baby You) class for expectant moms? Done. A Healthy Living BINGO wellness challenge? Done. It's awesome. And with the Air National Guard, I'm also awarded opportunities, such as being selected for commission, which will happen sometime within the next year. I have been pursuing a commission for the last year, and to finally be selected has been a very rewarding—and time consuming!—accomplishment. In my Veteran's Day post last week, I mentioned that I love what I do... and to be honest, love seems like an understatement. Sometimes life is crazy, busy, hectic, overwhelming, consuming, fast-paced, and entirely a whirlwind... and sometimes that's when it's the best—like right now. I'll take the crazy-pace any day if it means it's going to be this good. Because really, it's that good. Grateful—for all the opportunities. Thankful—for all the support. Excited—for what the future holds. And that about sums it up. I'm a citizen soldier... and I love it.